Headline inflation was steady at 0.2% yoy in December, while 2018 inflation rose 0.8% yoy, the mildest since 2009. We lower our 2019F inflation forecast from 2.7% to 1.8% in lieu of the downtrend in oil prices in the past two months. Fiscal constraints are transitory, as budget deficit set to narrow briskly after 2020 (11MP target: -3.0% of GDP) if fiscal adjustments are implemented. Coupled with a less hawkish Federal Reserve, we now project Bank Negara Malaysia (BNM) to leave Overnight Policy Rate at 3.25% throughout 2019. 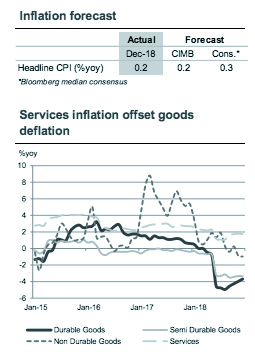 Headline inflation in December was in line with our expectation at a stable pace of 0.2% yoy (+0.2% yoy in November), while core inflation eased slightly to 0.4% yoy (+0.5% in November). The seasonally-adjusted headline CPI increased 0.1% mom in December (+0.2% mom in November). For the whole of 2018, price growth of 1.0% yoy was at its mildest since 2009 (+3.7% yoy in 2017), driven by changes in consumption tax policy. 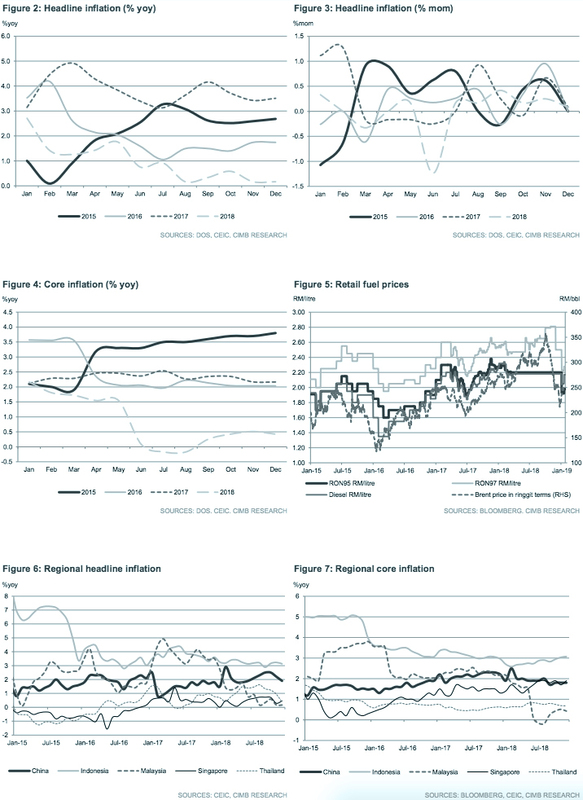 A five-day price control for 16 types of food commodities surrounding the Christmas season kept food inflation benign at 0.7% yoy in December (+1.1% yoy in November), while lower retail prices for diesel, RON95 and RON97 compared to December 2017 saw negative price growth in fuel and lubricants sub-index for the second consecutive month (-2.9% yoy vs. – 3.3% yoy in November). Following large declines in global oil prices, the government has opted to reinstate weekly fuel price adjustment to pass on lower fuel prices to consumers in a timely manner. The adjustment of retail fuel prices takes effect every Saturday. To curb price pressure in the event of climbing oil prices, the government imposed a ceiling price of RM2.20 per litre on RON95 and RM2.18 on diesel, until the roll-out of targeted fuel subsidy in mid-2019. According to Water and Land Natural Resources Minister Dr A. Xavier Jayakumar, water tariffs may increase in stages this year, in line with the government’s efforts to restructure the water supply services industry. While increases may vary across different states, we estimate that a blanket 10% increase could raise CPI inflation by 9bp, given that water tariffs currently account for 0.9% of the CPI basket.